What are Injury Ratings in NC Workers’ Compensation? Many injured NC workers have questions when their doctor assigns a permanent partial disability rating. Many times injured workers are contacted by an adjuster working for their employer’s workers’ compensation insurance company urging them to accept payment of a rating or offering to settle their workers’ comp case. Some adjusters even tell the worker this is the only benefit available to them. Unfortunately, many workers accept payment of the injury rating in their NC workers’ comp case and later regret it. Permanent Partial Disability (PPD) ratings are sometimes called “injury ratings” or “impairment ratings.” It’s all the same thing — a great big caution sign. There are a number of ways that disability is paid to an injured worker in a North Carolina Workers’ Compensation case. Generally, in order to receive disability benefits an injured worker must be physically restricted from some or all work, working fewer hours, or working for reduced wages. This is the case for Temporary Total Disability (TTD), Temporary Partial Disability (TPD), or Permanent Total Disability. But injuries to certain parts of the body are presumed to be disabling under North Carolina workers’ compensation law. These body parts are listed in North Carolina General Statute § 97-31, along with the number of weeks of presumed disability. Then an injured worker with an injury to one of these particular parts of the body reaches Maximum Medical Improvement, the authorized treating physician will generally assign a disability “rating” to that body part. This percentage rating is the doctor’s estimate of the percentage of permanent impairment to the affected body part. HOW DO YOU CALCULATE WHAT AN INJURY RATING IS WORTH? It is usually simple to calculate how much an injury rating is worth. Just multiply the injury percentage rating by the employee’s compensation rate, and then multiply that result by the number of weeks assigned to the injured body part. Percentage Rating Assigned X Number of Weeks Assigned to Body Part X Compensation Rate = PPD Rating. SHOULD YOU TAKE THE IMPAIRMENT RATING? by accepting a payment on the PPD rating an injured worker may be giving up a more valuable wage replacement benefits, including Temporary Partial Disability payments for up to 500 weeks. Accepting payment of an injury rating may make sense if an injured worker has shown the ability to sustain full-time work, at the same or greater wage as prior to the injury, and if little additional medical treatment is anticipated in the future. WHAT SHOULD YOU CONSIDER IF YOU DO ACCEPT THE RATING? be sure the employee is actually at Maximum Medical Improvement. MMI is the point at which the employee has reached the end of the healing period. It is not the point where a particular doctor has nothing else to offer. SHOULD YOU TALK TO A NC WORKERS’ COMP LAWYER BEFORE YOU TAKE THE INJURY RATING? Whether to take a workers’ comp rating in NC is a big decision. Sometimes adjusters suggest that payment of a rating is simply the next step in a workers’ comp claim. But there is nothing simple about accepting an injury rating in a North Carolina Workers’ Comp case. If you are thinking about accepting a rating you should talk to a North Carolina workers’ comp attorney. This is especially true if you have not returned to full-duty work at full pay, have suffered a significant loss of wage earning capacity, or are looking at continuing medical treatment for your injury. A workers’ comp lawyer can help you consider your options and select the one that is best for you in the long run. You should also talk to a workers’ compensation attorney if you are considering settling your workers’ comp case in North Carolina. Please feel free to call or click for your free consultation about your NC workers’ comp case. 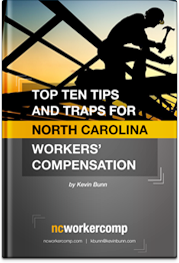 Kevin Bunn is a Board Certified Expert in North Carolina Workers’ Compensation Law. Kevin’s workers’ comp law office is near Raleigh, North Carolina.